Pack rate include: (a)Breakast, Lunch, Dinner (B/L/D) Snacks (local & native kakanin)buffet/fiesta or setplate servings. (b)Land and sea transport for island hopping and visit at Mt. Caglago where the statue of our Lady of Peace stands on top. Uphill is 527 steps. 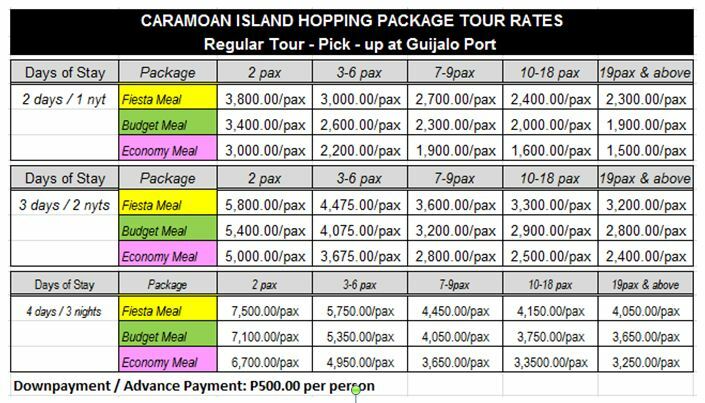 (c)Pick-up from and to guijalo port. (d) Tour guide. Note: Boat rental for island hopping is fixed regardless of number of passengers. The boat can carry up to 10 passengers. The rate for 2pax is remarkably higher because of the boat rental. Accommodation: Aircondition rooms of Istaran Hotel, with individual toilet & bath, bidet, hot & coldshower. Installed with flat TV and cable connections, intercom, side and coffee table, wall mountedfire exit diagram and advisories. Istaran Hotel Amenities: With coffee shop, aircondition function hall (first and only aircon hall accoomodating up to 180 persons), wi-fi ready, brown-out free, insurance coverage and DOT accredited.